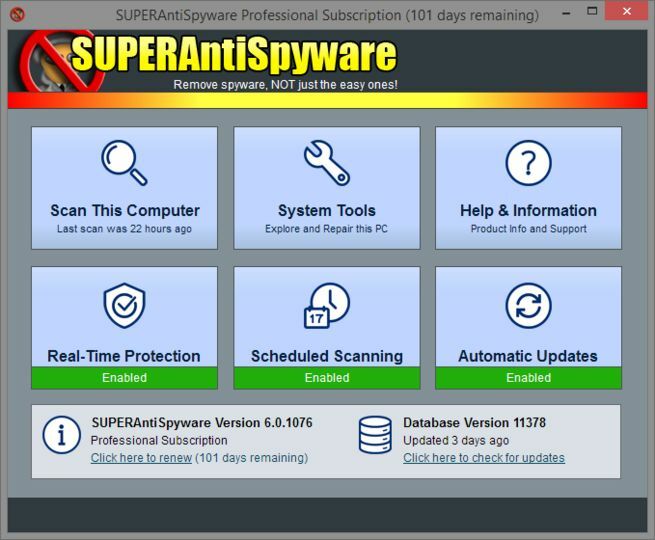 SUPERAntiSpyware Professional Edition is a comprehensive anti-malware tool for detecting and removing Spyware, Adware, Trojans, Dialers, Worms, KeyLoggers, HiJackers and many other types of threats. SUPERAntiSpyware Professional Edition offers quick, complete and custom scanning options for all types of media, including hard drives, removable storage drives and so on. It also will probe the system memory and Windows registry for threats. You can also schedule scans. It has a built in real-time blocking feature that can detect threats and block them before they can cause any harm. It's unique repair system can fix problems that arise from malware infection and persist afterwards. It can, for example, re-enable the task manager utility and registry editor. Items found can be removed completely or quarantines safely. SUPERAntiSpyware is a next generation scanning system that goes beyond the typical rules based scanning methods. Our Multi-Dimensional Scanning system detects existing threats as well as threats of the future by analyzing threat characteristics in addition to code patterns. 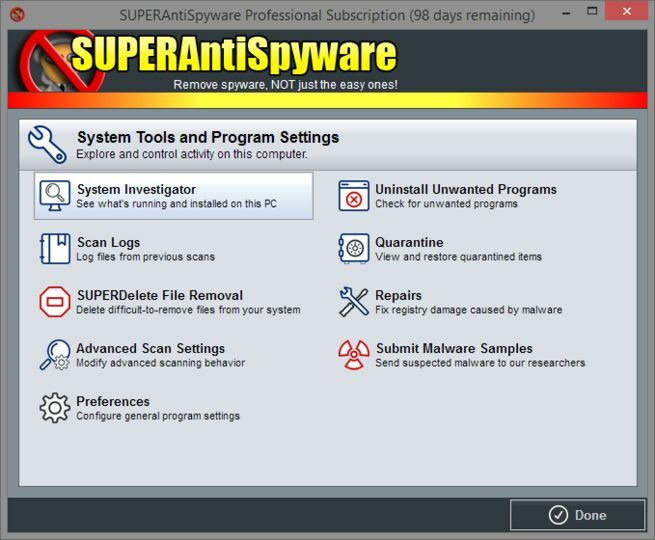 SUPERAntiSpyware examines over 50 critical points of your system each time your system starts up and shuts down to eliminate threats before they have a chance to infect and infiltrate your system. SUPERAntiSpyware features our unique Process Interrogation Technology (PIT) that allows threats to be detected no matter where they are hiding on your system. Many new types of threats utilize "Rootkits" or "Kernel Drivers" to hide themselves to avoid detection by standard anti-spyware applications. SUPERAntiSpyware's Process Interrogation Technology locates even the toughest of threats. SUPERAntiSpyware features a dedicated threat research team that scours the web daily and analyzes thousands of possible threats to provide the most up to date protection available by providing daily definition updates. 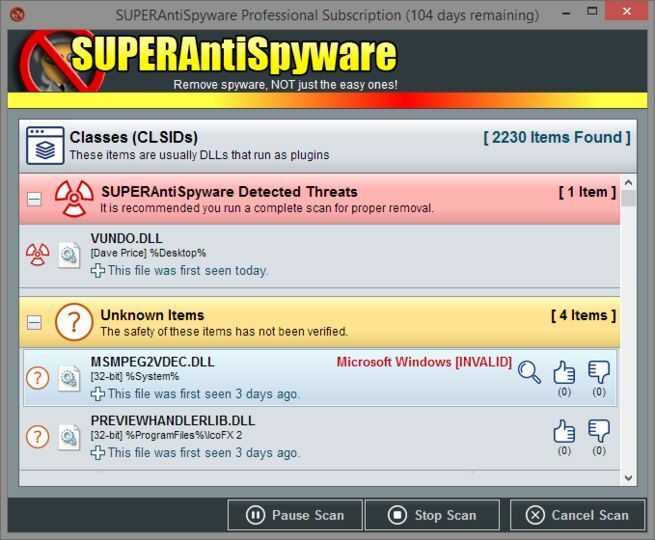 NOTE: This download is a free functional trial of SUPERAntiSpyware Professional Edition, allowing you to evaluate the product before deciding whether to purchase a license. If you'd prefer the more limited free edition, you can download SUPERAntiSpyware Free Edition from here.